Malcolm Fitzpatrick is a senior curator of mammals at the Zoological Society of London and a Sumatran tiger Global Species Management Plans (GSMP) convenor. GSMPs are born out of growing concerns about the long-term sustainability of wild animal populations in human care. To fulfil the full suite of conservation roles required of animals in zoos and aquariums, they must be demographically robust and genetically representative of wild counterparts. Many species will be able to sustain these characteristics for the foreseeable future only when cooperatively managed at a global level. A GSMP involves the management of a particular taxon with a globally agreed set of goals, while building upon and respecting existing regional processes. In his talk, Malcolm Fitzpatrick will give an introduction to ZSL and links with Indonesia. 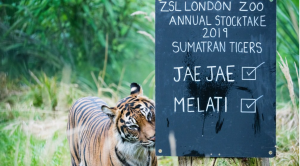 This includes ZSL’s management & breeding of Sumatran tigers at London Zoo and the Zoo’s support for tiger conservation in Indonesia. In addition, he will also discuss about the GSMPs with focus on four Indonesian species – Sumatran tigers, anoa, babirusa and banteng and how these four GSMPs collaborate with Indonesian Zoo Association (PKBSI). Next → Next post: Indonesian language and culture classes at the University of Nottingham. Starting week commencing 11 March 2019.